I have this working right now with 6 drop downs/lists. 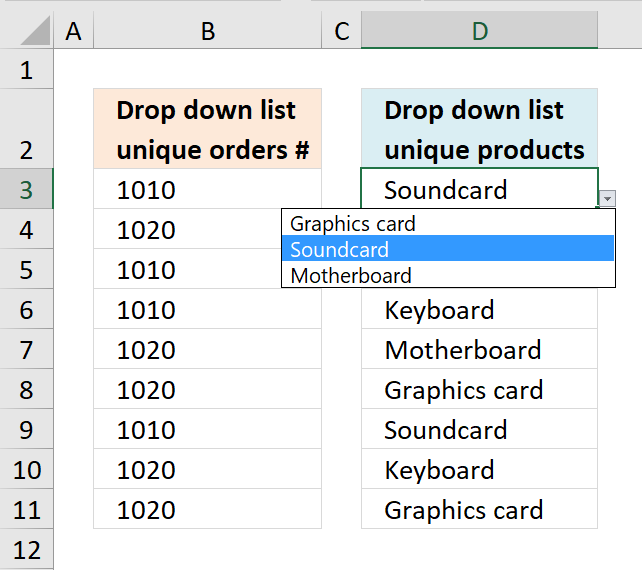 I wanted to see if you possibly know of a way to see additional information in drop down #4 if there are no selections in drop down #2 and #3. Currently, I have hemisphere in drop down 1, Sector in drop down 2, Region in drop down 3, and Area is drop down 4. 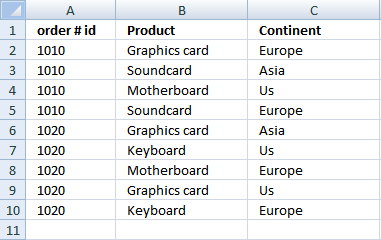 If I select a value in drop down #1 (Hemisphere), I would like to see what areas I can filter on in drop down #4 without having to select values in drop down 2 and 3. Yes, I have simplified my answer to three drop down lists. I recommend downloading the attached excel file before reading this post. Type =OFFSET(Sheet1!$A$2,0,0,COUNTA(Sheet1!$A$2:$A$1000)) in "Refers to:" field. Type =INDEX(order,MATCH(0,COUNTIF($A$1:B2,order),0)) + CTRL + SHIFT + ENTER. This is an array formula!! Copy cell A3 and paste it down as far as needed. Type a name. I named it "uniqueorder". Type =OFFSET(Sheet2!$A$2, 0, 0, COUNT(IF(Sheet2!$A$3:$A$1000="", "", 1))+1, 1) in "Refers to:" field. Select List in the "Allow:" window. Type =OFFSET(Sheet1!$B$2,0,0,COUNTA(Sheet1!$B$2:$B$1000)) in "Refers to:" field. 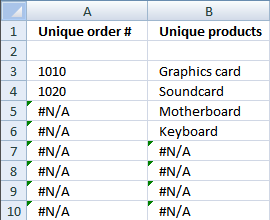 Create a unique distinct list from column B, sheet1. Type =INDEX(product, MATCH(0, COUNTIF($B$1:B2, product)+IF(Sheet1!$E$2<>0, order<>Sheet1!$E$2, order=""), 0)) + CTRL + SHIFT + ENTER. This is an array formula!! Copy cell B3 and paste it down as far as needed. Type a name. I named it "uniqueproduct". Type =OFFSET(Sheet2!$B$2, 0, 0, COUNT(IF(Sheet2!$B$3:$B$1000="", "", 1))+1, 1) in "Refers to:" field. Type a name. I named it "continent". Type =OFFSET(Sheet1!$C$2, 0, 0, COUNTA(Sheet1!$C$2:$C$1000))in "Refers to:" field. Type =INDEX(continent, MATCH(0, COUNTIF($C$1:C1, continent)+(Sheet1!$E$2<>0)*(order<>Sheet1!$E$2)+(Sheet1!$E$5<>0)*(product<>Sheet1!$E$5), 0)) + CTRL + SHIFT + ENTER. This is an array formula!! Copy cell C3 and paste it down as far as needed. Type a name. I named it "uniquecontinent". Type =OFFSET(Sheet2!$C$2, 0, 0, COUNT(IF(Sheet2!$C$2:$C$1000="", "", 1)), 1) in "Refers to:" field. 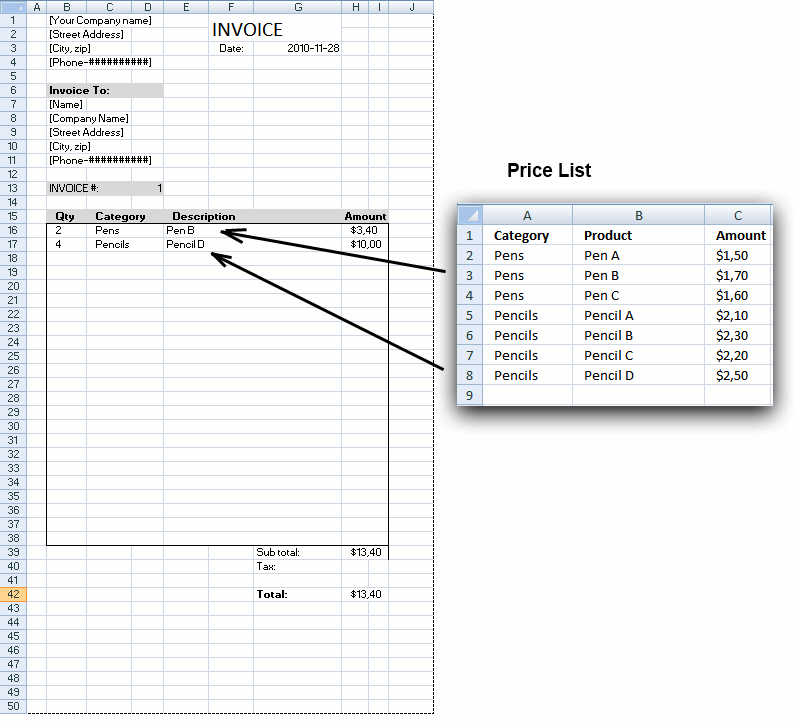 Example picture sheet1, first drop down list is blank and second drop down list contains all unique values. Outstanding, this works beautifully. Thanks for sharing your expertise. Great work so far but I was wondering if it could do something else...? 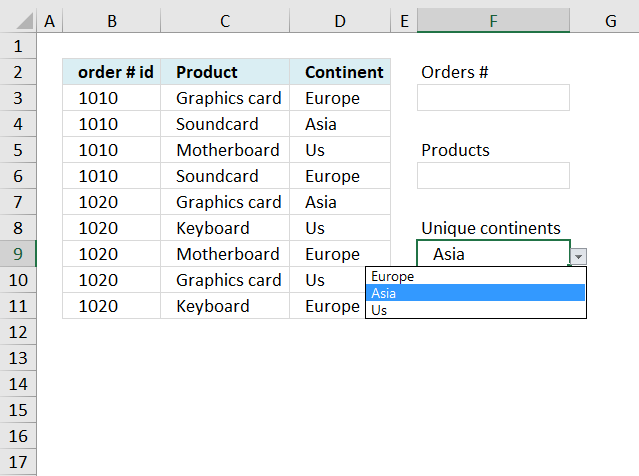 If I start off with all the down lists as empty and then, say, select keyboard as the product it successfully shows only US and Europe as the options - but shows both order ID, when it can only come from 1020. 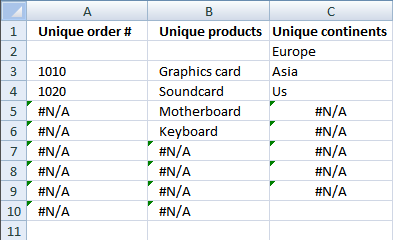 How can additional colums with more criteria be added to the exsisting three columns? 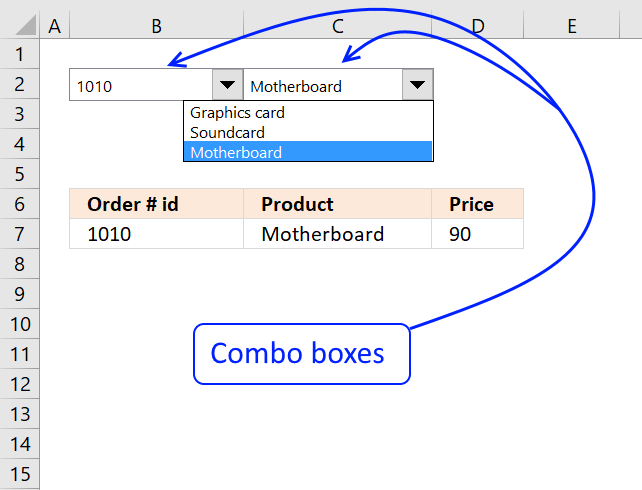 Can drop boxes be added to multiple rows, such as in an Invoice? 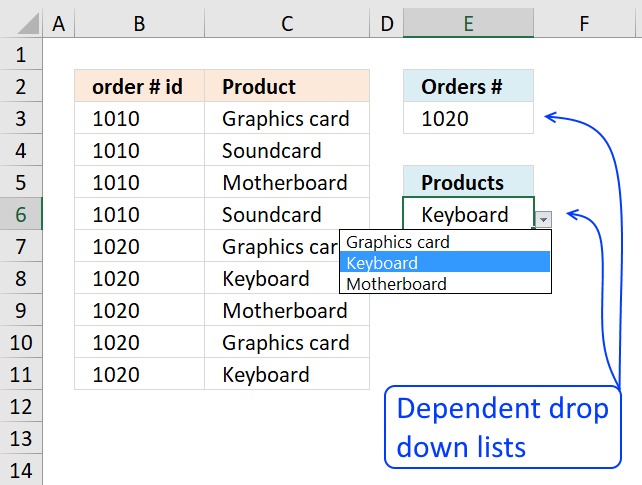 I seen your example "Create dependent drop down lists containing unique distict values in multiple rows" but how can those formulas be combined with the formulas in this example? Can a fourth and five column be added? I am not an expert, and I was wondering if there is any way that you can do and publish the same for 7 columns. Also, is the excel addin that you have created available to be downloaded for free somewhere? Digital Help - Microsoft Excel resource < Loved it!